[…]linear regression can be used to fit a predictive model to an observed data set of y and X values. After developing such a model, if an additional value of X is then given without its accompanying value of y, the fitted model can be used to make a prediction of the value of y. Simple linear regression is when y is a function of a single variable x and multiple linear regression is when y is a function of multiples variables, like x1, x2, x3, etc. 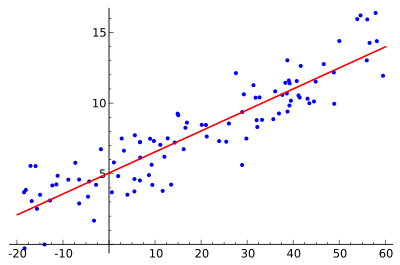 In this post we’ll cover simple linear regression. In other words and going direct to the point, linear regression is the linear trend line that we know from Excel as in the image below. As we can see, we have a set of points where y changes accordingly to a single variable x. Take as an example, the price of a car versus its year of manufacture. We can find a line equation which represents all the sampled points with the least possible error. With this equation it will be possible to predict y from new x values. The general equation of a straight line is . So, our problem is to find the best constants a and b. We know what is linear regression and what we can do with, now how can we find the best fit with the least error? First, how can we calculate the error? There are several ways to calculate it. You could just subtracts the real y by the predicted y. Or you could take the absolute values after subtraction, or you could first subtract, square it and take the average. Indeed, this is the mean square error which is used normally for data fitting which is our case. h in our case is the a line equation: . So, basically this formula subtracts y from the predicted value, square it to have only positive numbers, and take the average. The here will be useful later for gradient descent, but is not mandatory. From calculus class we know that with the first derivative we can find the local minimum of a curve. If the curve is a convex one, the local minimum is actually the global one. The idea is very simple but still very powerful and it’s used very often in machine learning. Equations 2 and 3 will give us the direction towards to the minimum. The size of each step is determined by a parameter called the learning rate. Everytime we calculate this, we make a step forward to the minimum. Define function h. In our case as simple linear regression, we used . Define error equation. In our case we used mean square error. Calculate new parameters a and b. In next iteration use this new parameters and recalculate again. A good way to debug the code is checking the error in every iteration. Here is the plot error vs iteration showing the error decreasing which is a good sign. After about 100 iterations the errors almost didn’t decrease. We can see as well in every step how we improve our final curve. We started with a = b = 0 which is the x – axis. With the update of a and b, we notice the line goes up towards the cloud of points. Although the error decreases and the algorithm converges, we can see that we actually found a local minimum since this line seems to split in half the set of points, but not in a optimal manner. We can even try with 10000 iterations and we’ll got the same result. So, start values for a and b can change the final result. Try different learning rates – . It makes the algorithm converge faster. If you error increases after some steps, try decreasing . Try different start values for a and b, since you can find local minimum. Test this code with different error function, play with different data, start point for a and b, test different values of alpha, understand the code and overall, have fun! As we can see, linear regression is quite simple but powerful enough to solve simple problems. The most important thing is the concept which will be used for others algorithms that we’ll discuss later on the blog.